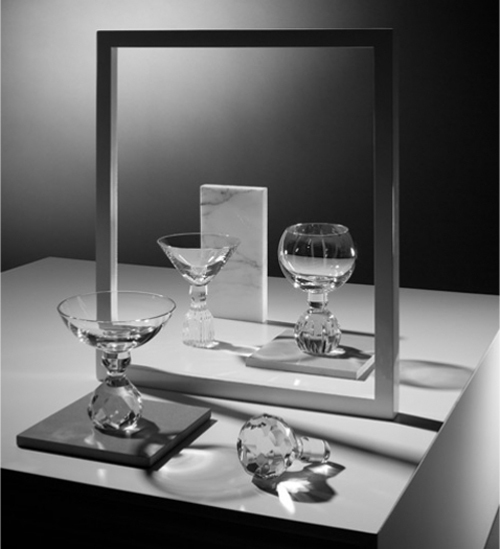 Lee Broom launches his debut collection of glassware titled 'Half Cut'. 'Half Cut' integrates the unused crystal stoppers from Broom’s Decanterlight collection, which are individually sourced from antique markets making each stopper and therefore each glass entirely unique. Transformed into bases for this stunning three-piece collection, each original stopper serves both as a functional and decorative element for each glass. Each stopper is polished, cut and then fused with a hand blown lead crystal vessel which forms the glass and etched on the bottom with the signature Lee Broom crest. The collection to be sold in the UK exclusively at Liberty reinterprets an everyday object while infusing it with a sense of heritage and craftsmanship.